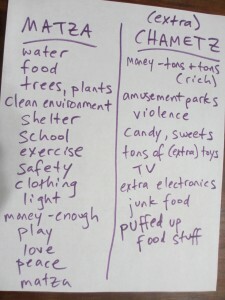 Cha-METZ literally means “leavened.” Preparing for Pesach includes removing all of the chametz from your home. The laws of Torah tell us that we’re not to eat, own, or benefit from chametz during the festival holiday of Pesach. In Ashkenazic households, chametz includes grains as well as legumes. There’s a tradition of selling your chametz to a non-Jewish neighbor for a token amount and then buying it back after the holiday. And I say it’s all about your spiritual Chametz. Let’s look at it as the “puffed up” non-essentials in your life. To me, this is about an anual Spring Cleaning ritual. De-cluttering and making space for the new. We say, “On all other nights, we eat both chametz and matzah, on this night we eat matzah.” All year long, we have both essentials and non-essentials in our life. On this night, we honor what is fundamental and vital. Matzah, made of the basic nourishing elements of wheat and water is a symbol of the heart and soul of what is really important in life. 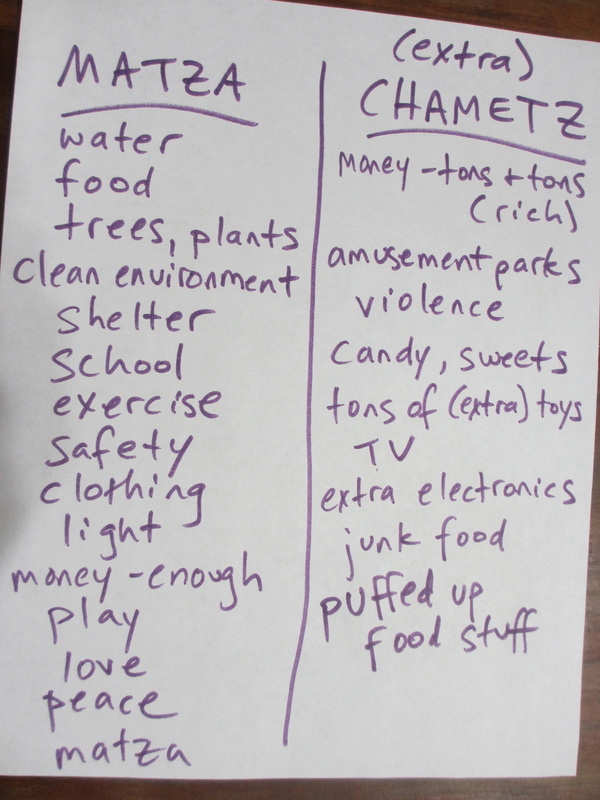 My chavurah class, all 7 year-olds, made this list of the “matza” in their lives verses the “chametz.” What would go on your list?